Character, Courage and Commitment – these are attributes that symbolize the best in each of us. 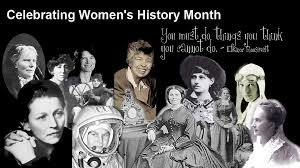 What powerful words to be chosen for the 2014 Women’s History Month theme – illuminating the accomplishments of women, shedding light on their historical impact and celebrating the many contributions of – notable and (extra)-ordinary women. Over a century ago, International Women’s Day was first celebrated on March 8, 1911, in Europe. At the time, woman’s rights were a burning political issue in the United States as well. Women’s suffrage and winning the right to vote was at the forefront of many women’s organizations. Women and men alike were writing books documenting the events of the time and supporting the cause. With the advent of the economic depression in the 1930s and WWII, women’s rights became less of a priority and went in and out of focus over the coming decades. Fast forward to the 1960s – it was a time of change, call for inclusion and increased awareness – organizations galvanized, government programs and legislation were enacted and a major shift was being felt across the country. One of the areas realizing a dramatic change, with the passage of ground breaking legislation and a new vision, is that of the women-business owner. Since the 1960s, the number of recognized women-owned businesses in the United States grew from less than 10 percent to more than 50 percent. In part, due to certification programs that establish goals for participation in government purchasing and contracts for women-owned and minority- owned enterprises, along with others. In fact, it is projected that by 2018 33% of new jobs will be created by women-owned firms. With the recent focus on women’s history month, and throughout the year, it is important to honor women who are making a difference in countless areas – from sports and education to business and politics. Learning more about the history of women, and the history of all people, makes for a world filled with better understanding and appreciation for what makes each of us special.